Imagine you have been commissioned, by a relative, or a friend, or even a customer, to make something. You know it's well within your capabilities, and straight away you are working out how to do it, what materials to use, and how much it's likely to cost. But there is some debate about height and width, and a bit of uncertainty over the details. The problem is, you've never been very good at drawing, even back of the envelope stuff, and as for drawing perspectives, that's completely out of the question. This is a problem that most woodworkers, amateur and professional alike, encounter in their working lives at some time or another. So what's the solution? What about drawing it on a computer? 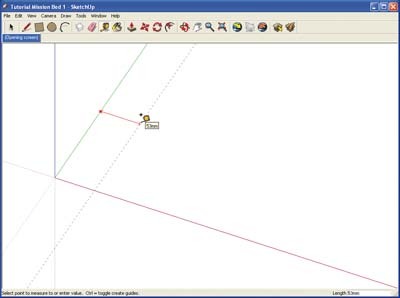 There are quite a few CAD or computer aided design program on the market, at a reasonable price, but like many people you could have been put off by the vast array of controls and buttons that many software companies seem to think makes value for money. 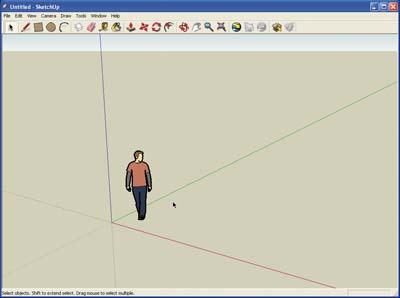 Well, help is at hand, in the shape of a program called SketchUp, now owned by Google, and which is not only one of the easiest 3D drawing programs around to learn, but is also free! Just log into Google's website, or just enter this URL in your browser and follow the instructions. 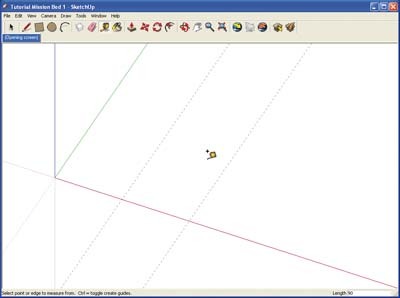 Notice there is also a Pro version which you can pay for So, when you open SketchUp for the first time, you might notice two or three unusual things about the program. In the first place, you are being offered help in the shape of tips and online step by step tutorials to get you started. 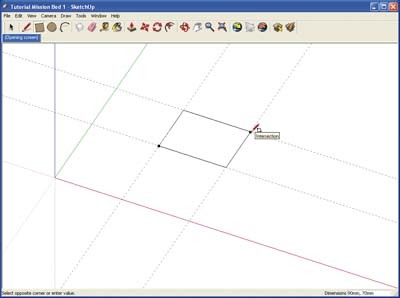 SketchUp is supported by the most comprehensive and user-friendly online help that I have encountered in 20 years of learning and teaching software. From the basics of drawing first lines through to making a 3D drawing of a house, there is a great combination of well illustrated pages, animated and interactive lessons, and videos you can download. And you will need them, in the end, since although as I have already said SketchUp is probably the easiest 3D drawing program around to pick up, there is still quite a steep learing curve, and you might be tempted more than once to just give up and go back to sketching on envelopes. The second thing you might notice, is that there seems to be someone standing centre stage, waiting to give you directions. He is called Bryce, and the fact that he's standing there underlines the person centred approach that is typical of this software. It is surprisingly easy to lose your orientation when working in 3D, and SketchUp works hard at giving us visual clues to help us maintain awareness of where we are. Bryce is certainly one, although most people either delete or hide him, poor chap, once they get used to things, and the colored axes, or lines similar to compass points are another. The third thing that I think is remarkable is just how few buttons, dials, levers and other paraphernalia there is. Not only does this help to get used to finding the button you need at that moment, but it gives you a larger working area to do what you here for, draw! Because it's almost always the case that no matter how big a screen you are working on, you will wish it was a bit bigger, so that you could just make out some detail a bit better, or not have to pan across to see another part of the drawing, when you need to look at all of it. And that is where we will start, with the Getting Started toolbar. Click on the View menu, and right at the top you will see the Toolbar option. Select that, and another drop-down list of all the available toolbars appears. You only need a tick against one for now, the Getting Started toolbar. 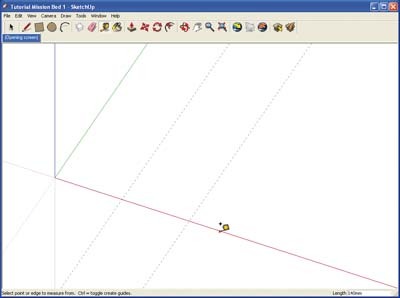 Once again, the people at SketchUp are thinking about YOU, and giving you, the learner, a special toolbar. Because there is so much free help available, I'm not going to try to teach you everything about using SketchUp in these articles. So your next assignment is to work through some of the exercises available, just to get the hang of using zooming in and out, panning and orbiting, which basically means revolving in 3D space. Try not to take it too seriously, and if you get stuck, just go on to something else. You can't break anything, and don't worry about getting things right first time. You can actually have a lot of fun messing around with this software. Once you feel you are starting to get comfortable with knowing where you are, and how to look at things from different angles, its time to start drawing. 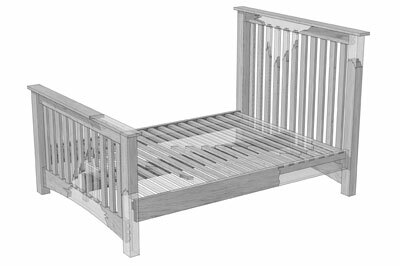 The project I have chosen is a Mission Bed which was published in issue 11 of WPP, which I hope has just the right balance of shapes to give you a good introduction to 3D. detailed working drawings on a regular basis, there are other programs that do it better. 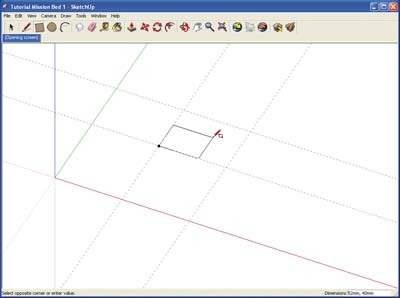 Although it iss quite capable of coming up with a perfectly acceptable set of dimensioned elevations, SketchUp is primarily a 3D modelling tool, and is not classed as a CAD or Computer Aided Design program.